It’s summer and watermelon is everywhere. I was curious if watermelon could be incorporated into a main dish and started looking around. 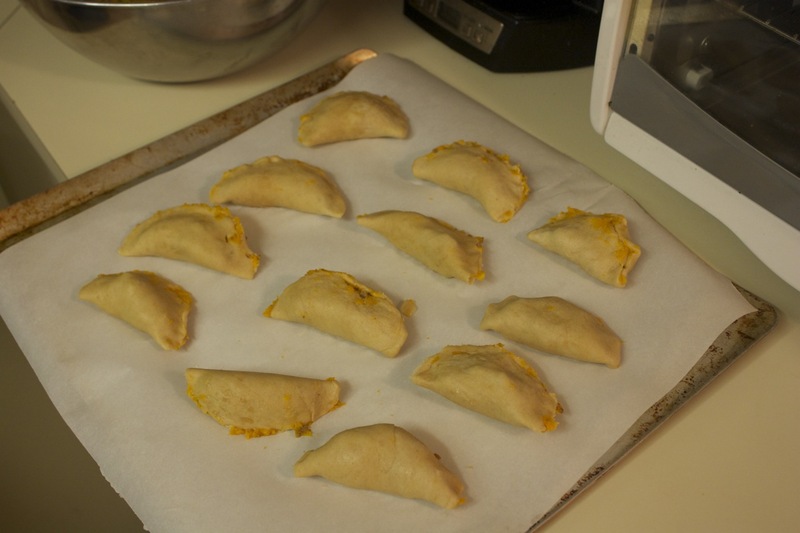 I came across this recipe at MyRecipes.com (originally from Virginia Willis in Southern Living) and gave it a try. The sweetness of the watermelon is nicely balanced by the salt and spices. 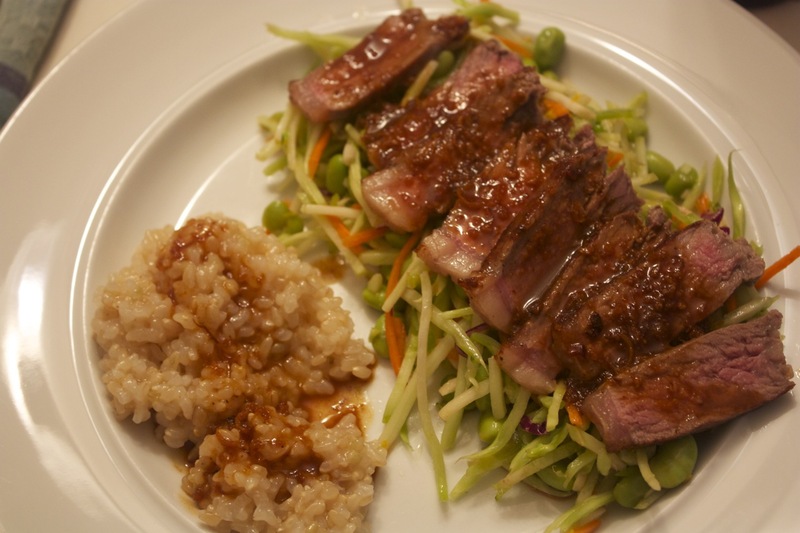 The original called for hoisin sauce as one of the main ingredients of the sauce part, but we’ve not found one that we trust as not being made on shared equipment with fish, so I made up something that seemed to work well for the sauce. Mix marinade: garlic, cornstarch, water, soy sauce, olive oil and wine and marinate the steak slices for 30 minutes. Meanwhile make the sauce: stir together water, corn starch, soy molasses, wine. Remove steak from marinade, discarding the marinade. Heat 1 tsp olive oil in a large skillet over medium-high heat and cook half of beef at a time without stirring, 45 seconds or until browned; turn beef, and cook 45 seconds or until browned. Transfer to a warm plate. Stir-fry the onion until tender, about 2 minutes. Add sugar snap peas, carrots, ginger, and crushed red pepper; stir-fry 2 minutes. Add beef and sauce mixture; stir-fry 1 minute or until slightly thickened. Add black pepper, and red pepper to taste. Pink Parsley is always a source of great recipes, and the author is pregnant with twins and craving stake. Hence this awesome recipe she posted! 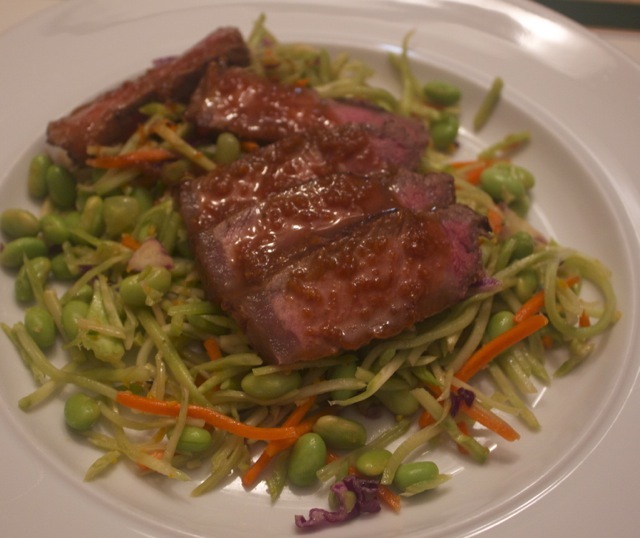 This was simple and delicious, the sauce serves as a dressing for the slaw and gets reduced for a sauce on the steak. Easy enough for a week-night, good enough for company! We tend not to have sesame oil like the original recipe calls for, so I substituted olive oil. We’re also not fans of raw red onions, so we we left that out too. With prepackaged broco-slaw mix and cooked edamame, this is really a fast meal to whip up. We served it with brown rice, which was the longest part of the cooking. If serving with rice, start the rice. 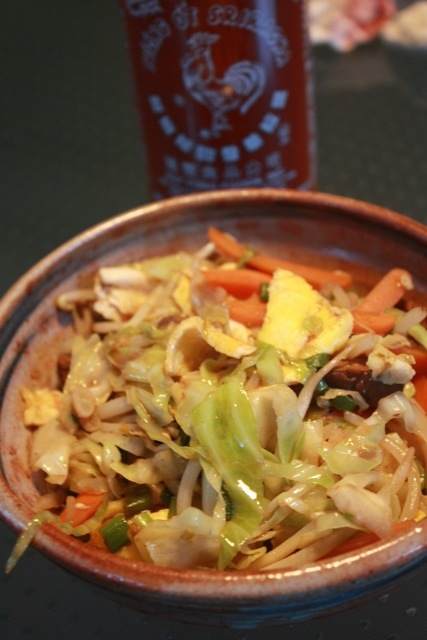 In a small bowl, combine the soy sauce, orange juice and zest, vinegar, and ginger. In a large bowl, combine the broco-slaw and edamame. Take 3 Tbs of the sauce and add to the slaw mix. Mix and refrigerate until the rest of the meal is ready. Remove the steaks and tent with foil while you cook the sauce. Add the rest of the sauce to the pan and simmer for a minute or two, scraping up the burned bits off the bottom of the pan. When the sauce is thickened, remove from heat and add the butter one tablespoon at a time, melting into the sauce. To serve, put some slaw on the plate, top with stakes and the sauce. If serving with rice, put some sauce on that too, it's good stuff! 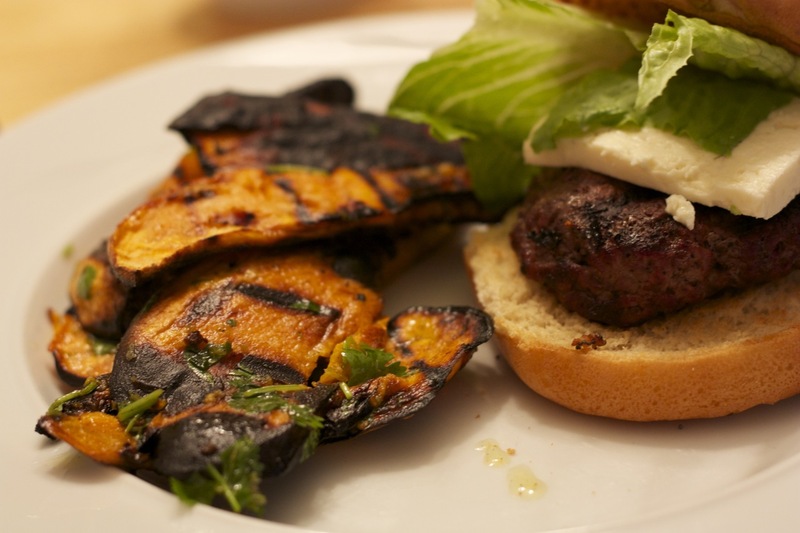 It’s great to fire up the grill in the summer and when I ran across this recipe for Grilled Sweet Potatoes, I knew I had to try them. Wow, the lime-cilantro dressing on these was awesome! Paired with a burger topped with feta cheese and some lettuce, this was a great, easy meal. Preheat the grill to medium-high, direct heat. Peel the sweet potatoes and slice into ¼ inch thick slices. Coat the slices with olive oil. Form the beef into patties. Grill the potatoes and burgers, 3-6 minutes each side or until the burgers are cooked as you like and the sweet potatoes are softened and have some nice grill marks. While things are grilling, mix the cilantro, lime zest and juice, oil and salt in a large bowl. Add the sweet potatoes to the dressing and mix. Place the burgers on a bun with a slice of feta and some lettuce. We’ve started a pot herb garden with mint, basil and cilantro. So far, the mint has been going gangbusters, so there’s an abundance of fresh mint for recipes. Googling around for a good way to use mint in a main dish led me to this recipe from the Miami Herold. It was a nice change from standard burger, but very easy to make. We made some bread to serve it on and served with sweet potato fries. Form beef into patties, season with salt and pepper if desired. Cook on bbq grill. While burgers are cooking, mix yogurt and feta. Toast or grill the bread. 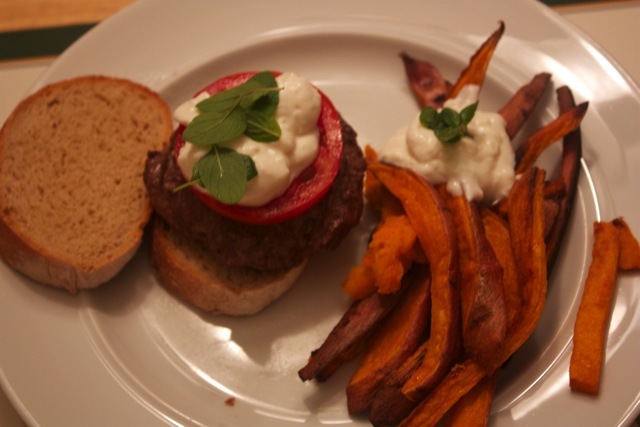 Assemble burger with a dollop of sauce, slice of tomato and fresh mint leaves. 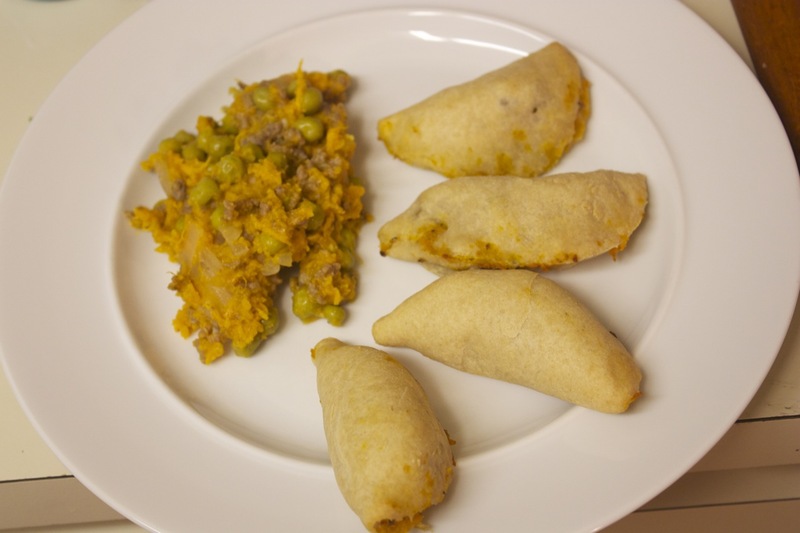 As we tend to do, we made a bit of a mashup and came up with a yummy meal. In a large bowl mix the ingredients from garlic through vinegar. Grill the steak a few minutes on each side until cooked as desired. Slice across the grain into bite sized pieces. Add the steak to the sauce in the bowl while it is still warm and set aside. Add 1 Tbs oil to a pan and heat over medium heat. Cook the egg like an omelet. When it’s cooked through remove from the pan and slice into strips. Add the other Tbs oil to a pan and heat over med-high heat. Add the green onions and then cabbage and stir fry. Add the carrots and cook for a bit. Add the bean sprouts and cook stirring. Add the meat with the sauce and cook until the sauce has thickened a bit. Serve over rice with sriracha sauce. 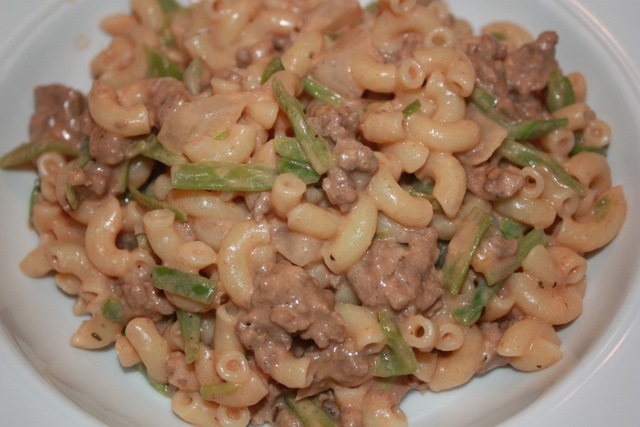 This recipe from Our Family Eats was a great, fast, weeknight meal. We added a bag of french cut green beans to add some veggies. Just like Our Family Eats’ kids, ours ate this up! The recipe made a lot, so the kids were happy to take it for lunch the next day. This is from Mark Bittman’s The Food Matters Cook Book (p. 410, also posted on this blog). This was really good! 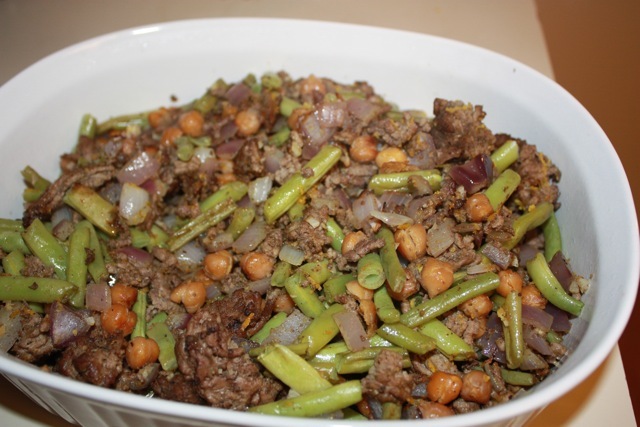 The crisp chickpeas and beef had a great texture. We made the Campfire casserole from Leanne Ely’s Saving Dinner on Sunday. Yummy, though either increase the filling or make less cornbread topping. Lots of yummy leftovers!